AKHNOOR, tehsil headquarters and a small border town on the right bank of the Chenab, is perhaps the most important place in the Jammu region if one goes by the historical and archaeological facts attached to the town. Towards the east of the town is situated a brick fort with one face resting on the Chenab river. The fort, of late, has gained considerable attention as terracotta items belonging to the Harappan civilisation were excavated from different parts of the fort and the surrounding areas. Now in ruins, this fort has been taken over by the Archaeological Survey of India (ASI), which has declared it a national monument to be preserved and protected under the Monument Act, 1958. Before the ASI took the fort in its possession, various parts of it were encroached upon and altered by the state government. Two reservoirs for supplying water to the town had been constructed, destroying important evidences and terracotta items in the process. Archaeologists have excavated pottery belonging to the Harappan period. According to Dr S. Mani, an official of the ASI, Akhnoor was the last Harappan city from where the Harappans used to collect timber. Some household items, bangles and stone age tools of the Indus Valley Civilisation have also been found in the fort and the town. 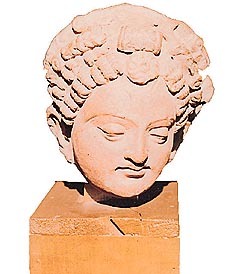 Busts of Buddha dating back to 3rd century are among the most prominent terracotta statues found here. 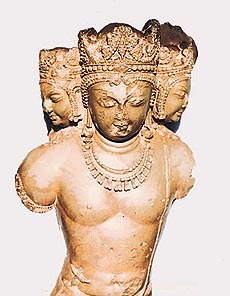 These life-size terracotta busts currently placed in the Dogra Art Gallery at Jammu, indicate that at one time this place was inhabited by believers of Lord Buddha. This place was dominated by people belonging to the Hindu religion, as is revealed by a Trimurti idol found from Ambarran village, about 5 km from the town. This green-coloured one-piece stone idol dates back to 9th century. The ASI has launched massive excavating operations inside the fort and the surrounding areas. The excavation done last year at Guru Baba Ka Tibba, a few kilometres from Akhnoor across the Chenab, yielded terracotta items of the Harappan period. This year the ASI successfully excavated earthernware of the same period at Jafarchak, also near the town. This has further strengthened the claim that Akhnoor and its surrounding areas were the last bastion of Harappans. Beyond Akhnoor, towards the upper hilly area that joins Shivalik hills, there has been no trace of any object that could show that Harappans were spread beyond this town. This fort, where excavation is still in progress in a phased manner, is perched upon an ancient site depicting three periods of history. The first period is represented by the Harappan red and grey earthenware that include jars, beakers and goblets. The other objects were copper pins, bone arrowheads, terracotta cakes and sherds with Harappan graffiti. The second period is marked by the presence of early historic pottery and the third period is represented by Kushana objects and an impressive wall of rubble diaper masonry flanked on both sides by a 3-metre wide street. The latest construction of the fort was started by Mian Tej Singh and completed by his successor Rajan Alum Singh in the early 19th century. The fort has a high wall with bastions at regular intervals and is crowned with battlements. There are two-storeyed watch-towers at corners which are also crowned by battlements and merlons. The fort has been bifurcated by a wall with a gate leading to the palace located on the southern side. The palace is two-storeyed and the walls facing the courtyard have decorated arches, some of which contain mural paintings. Access to the fort can be obtained through the river side as well as the northern side. A large part of the fort is in ruins and has been encroached upon by modern structures as already mentioned. However, an ancient Mahakali temple near the inner wall has been renovated recently, restoring its antiquity. The location and huge walls of the fort depict the vast vision of the king who made it almost inaccessible to the enemy. The town was named Akhnoor by Mughal Emperor Jahangir who once visited the area and the fort on the advice of a saint when his eyes got infected while returning from Kashmir. Amazingly, Jahangirs eyes were fully cured by the fresh air of the town blowing over the Chenab. He called the town Aankho-Ka-Noor (light of the eyes) and since then the place came to be known Akhnoor. The Raj Tilak ceremony of Maharaja Gulab Singh  the founder of Jammu and Kashmir State  was held here on June 16, 1822. On a raised platform below jeopata trees, Maharaja Ranjit Singh of Punjab performed the coronation ceremony and enthroned Gulab Singh, the Maharaja of Jammu.